In titling his book (or having his book titled?) 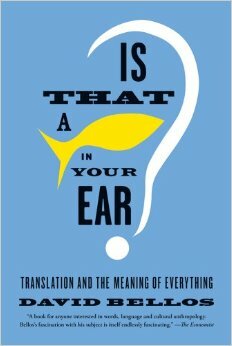 “Is that a fish in your ear?”, David Bellos has certainly made categorising this work a difficult task. It looks and feels like it should belong firmly in the ‘popular science’ section, yet as other reviewers have pointed out, the writing sits it firmly in a half-way academic category. Still, the material covered should be of interest to a wide range of readers, with the book split into fairly short and relatively self-contained chapters, that one can really dip and choose or skip out the parts that are of little interest. The book covers a very wide range of topics, and skitters over numerous areas such as philosophy, biology, religion and of course linguistics. One of the first things that struck me about the work as a whole was that Bellos was taking the opportunity to defend his profession, or at least his approach to the business of translation. Chapters often deal with a particular assault on translation or translators, mainly in the form of an every day platitude, which is then investigated, tested and (for the most part) satisfactorily overturned. I found myself disagreeing with his opinions on occasions, but the evidence is presented well enough that the reader can draw his own conclusions most of the time. Neverthelees, there appear to be some contradictions in the book, and some of his arguments felt at times overdrawn. For instance, he criticises a statement made by Nabokov regarding Pushkin’s poetry that ‘to reproduce the rhymes and yet translate the entire poem literally is mathematically impossible’. He then goes on to illustrate how the form of said poetry lent itself well to translation, and that the root of Nabokov’s statement lay in his reluctance to attempt it. Whilst this isn’t necessarily untrue, it doesn’t detract from Nabokov’s original statement about the impossibility of translating both form and content, nor does the statement that other gifted translators give a ‘good approximation of Pushkin’s verse’. Bellos’ own chapter on poetry, as another reviewer well pointed out, if anything confirms Nabokov in his statement. In his defense of translation, Bellos covers a wide range of fields and periods, from Sumeria through the Bible to the EU, with humour, legalese and interpreting all playing a part. He depaints the difficulties the translator faces, having restrictions of space (e.g. comics), time (e.g. film subtitles/dubbing), dealing with grammatical features that are missing in target or source language, or simply requiring clarification of meaning where there is none to be had. The chapters covering the workings of the EU and the UN are particularly interesting, as is the thread running through the work about the dominant role of English and its potential effects on other languages through the work of translators. Another strong point is Bellos’ inclusion of plenty of examples and anecdotes that help to elucidate his points, both in terms of the difficulties and the successes. Whilst there were a few statements in the book which I would consider ‘mistakes’, these were always peripheral to the main argument, and the work is otherwise extremely well-researched and detailed. Bellos writes with authority, and despite his strong points of view never comes across as condescending – in fact, a real sense of modesty peers through his writing, especially when dealing with areas of translation that are not his particular field. Ultimately, this is a book that will definitely appeal to the right reader. Despite my finding some of his arguments to be not particularly convincing, Bellos presents enough information and evidence to allow his readers to make their own minds up. As an overall introduction and summary to the world of translations, this book is a thorough success, most suited to students of language, those considering becoming translators, and perhaps people interested in finding out more about the translations they themselves consume. Yet as others have pointed out, it isn’t as straightforward a read as the title or dustjacket make out, so a quick dip into Amazon’s “Look inside!” feature would probably save a few rumpled foreheads. A battle is developing between them’ I say developing, because it’s not yet on.